The mind with our perceptions of it. Finally, the spirit stirs as we transcend the particular perceptions to form universal conceptions. An appropriate relationship within & between these twice three aspects is an essential quality of a flourishing life. And how does this relate to our project of integration—Structural & otherwise? 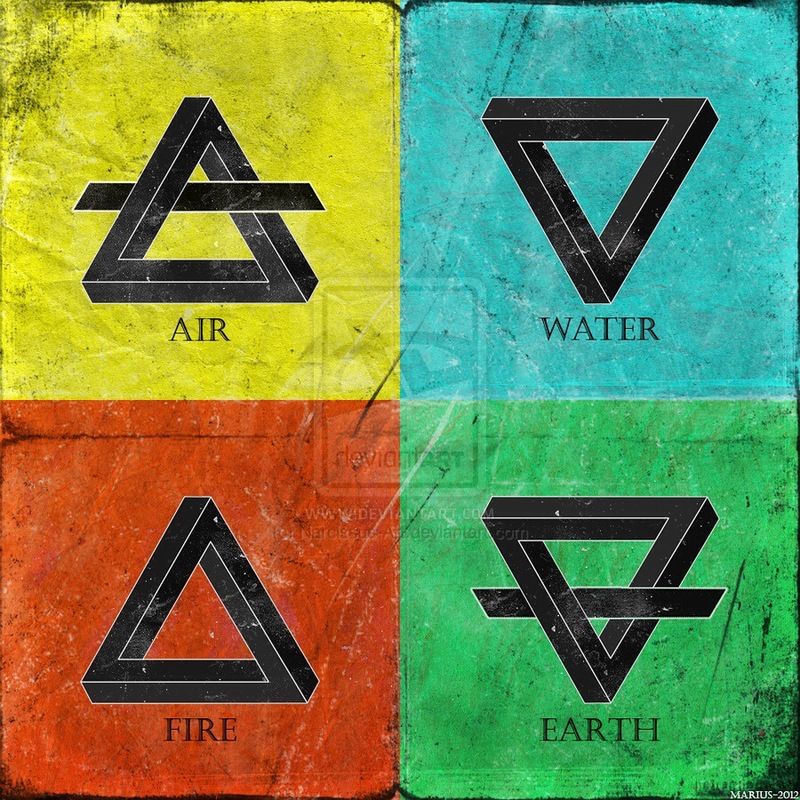 Each element symbolically represents certain qualities & characteristix. Integration is the product of balance within & amongst the several elements; struggle arises through surfeit or dearth. We will begin this examination with Earth—most substantial of elements. Earth stands for structure, weight, density, & solidity. Earth supports us, grounds us, nourishes us. Alignment of the physical body—Structural Integration—is a fundamentally a telluric inquiry. How does the physical structure—figurative Earth—relate to the actual planet Earth under gravity? If this quality is balanced, our structure will be sturdy. When Earth over-expresses relative to the other elements, however, we ossify. Our bodies harden. We find ourselves bound, fixed, & rigid in the affairs of all Three Kingdoms. Too little Earth, conversely & we forfeit substance, structure, support, & dependability altogether. We find ourselves prone to float away into the cloudless sky like untethered balloons at a State Fair in Montana. Water provides us with the ability to respond to our ever-changing environs in the most efficient manner. Notice that a trickle of water always finds the path of least resistance. Notice too that, in a water-filled barrel, no matter where one should think to poke a hole in it, the water would spill out at that precise point without a moment’s hesitation—”Hold to the center,” the Tao also counsels: you can’t surprise it. This is the watercourse way & the wellspring of Water’s genius. The quote is tragic to us because it reminds us of transience. Nothing lasts. We recognise that water would never meet the quill of the will to inscribe Keats’ turn of phrase—instead the liquid would simply disperse about it. So good thing they carved the said epigraph in stone; something more solid. This represents the negative quality of even this most “highest good:” too much fluidity renders one spineless, inclined to wriggle out of direct confrontation at all costs. Naturally, we seek balance, for too little fluidity renders us brittle. This represents desertification of onetime supple tissues: in a drought we dry up like a dead cactus or a yucca tree. What to do with such a goodly pyre of desiccated cacti? Fire is the element of transformation. And in this process, Fire necessarily consumes the original substance. Fire is energy, passion, heat, light. Fire is volatile & sometimes unforgiving: once we transmute our pile of saguaro-shavings into ash, we can’t recover the dusty original. Likewise once you eat a banana, you can’t get it back ( in its original form). Fire represents the force of metabolism—the transformation food into energy. Not only does Fire digest food, but likewise experiences & emotions. Fire also represents will, drive, energy as well as direct, unmediated knowing. Consider an interpersonal relationship in which one party plays with Fire & the other Water—the one advanceth whilst the other disperses; direction met by dissipation. Fire is utterly unfulfilled & Water feels continually violated. Obviously this would be a challenging interaction to negotiate, & both parties were well-served with the understanding that this elemental paradigm offers. Where Water threatens to stifle Fire, Air runs the opposite risk when the two meet in over-expression. Air represents activity. We only feel air when it moves, we only see it when it rustles the linden leaves on an August afternoon. Air animates, mythologized in manifold traditions as the activity of breath. Air, as breath, is the hallmark of life itself. A superabundance of air becomes a tornado, business for its own sake, activity that is frenetic (try windsurfing in a hurricane). Conversely, in its lack one might as well be a vegetable, or mineral—inanimate. Air, when balanced, performs effective action—it never hurries, yet leaves nothing undone. The use of the cart hinges. depends on what is not. Where will you put the pie if the pie-plate’s already full? Or the last marble when there is no room left in the jar? In the beginning, God created Heaven & Earth. The latter, they wrote, “was formless & void.” Picture the parchment before it felt the prick of their holy quills…it was blank: “Form arises from Emptiness.” There is of course an auditory analogue: imagine a bishop all bedight in satin robes enunciating this holy verse from the holy pulpit. Now imagine the sound right before he opened his blesséd mouth…nothing, nosound, silence. The sermon to follow depended on this emptiness—indeed the silence persisted through the sermon, we just ceased to notice it with the bishop’s first enunciation. A rose by any other name would smell as sweet & whether we call it space, void , silence, stillness, emptiness, or ether, nothingness is the container in which everything resides—the vacant stage whereupon the drama of the entire cosmos unfolds. The four elements as the four quadrants represented by the symbology of Medieval alchemy, & the fifth element expressed as the canvas itself!